120% match + 200 free spins. 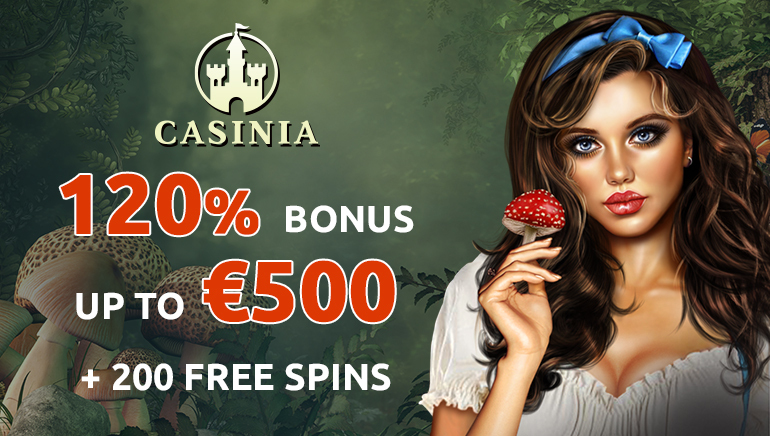 Casinia Casino is offering an exclusive bonus to players who sign up through Online Casino Reports: A 120% match bonus up to €500 — 20% more than its standard offer — plus, a whopping 200 free spins. It’s pretty simple. Just log ontoCasinia Casino and begin the registration process. It literally takes less than a minute — create a username and password and type in your email address and the bonus code OCR777. You’ll then be asked your name, date of birth, the country and currency you’re playing in, your address, and phone number. And voila — once you register and make a deposit, you’ll get a 120% match bonus + 200 free spins. After you’ve enjoyed your exclusive OCR offer at Casinia, you can take advantage of the casino’s recurring promotions, such as free cash and free spins on weekends, Football and Tennis Free Bets, weekly reload bonuses, regular cash back, and loyalty points. Casinia offers a full-fledged online casino and sports betting action around the clock. What’s more, the casino boasts games from industry-leading developers, a variety of secure deposit options, and live chat support. All in all, its the ultimate destination for fans of online casinos and sports betting.